"Stephanie's prose is, like the Gita itself, insightful, compassionate and filled with moments of personal enlightenment. If you read this, let it settle snugly in your heart; you will see the extraordinary in every ordinary moment. It is a journey of discovery that begins and ends in your soul." 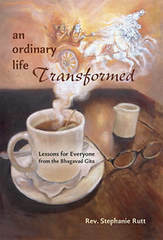 "For those who truly wish to understand the important messages found in the Bhagavad Gita, Rev. Rutt's book gives us all a clear picture of the life-directing principles of Hindu philosophy. It shows, in an easily understood format, how we may apply these principles directly to our own life experiences. It is a "do not miss" book for anyone who is looking for answers to life's everyday challenges.